After the first deposit, you will be getting 20 FREE SPINS for 9 days straight until you reach the total of 180. Free Spins are given on Starburst, Boomanji or Fruit Zen slot games. Last week a lot of people enjoyed the spins on The Angler, so we figured we'd give you some more spins! Join us on a thrilling fishing trip where you're able to reel in some spectacular wins. Fishing is actually kind of similar to playing slots. Sometimes you go home empty handed, but the dream of that legendary big win is always there! 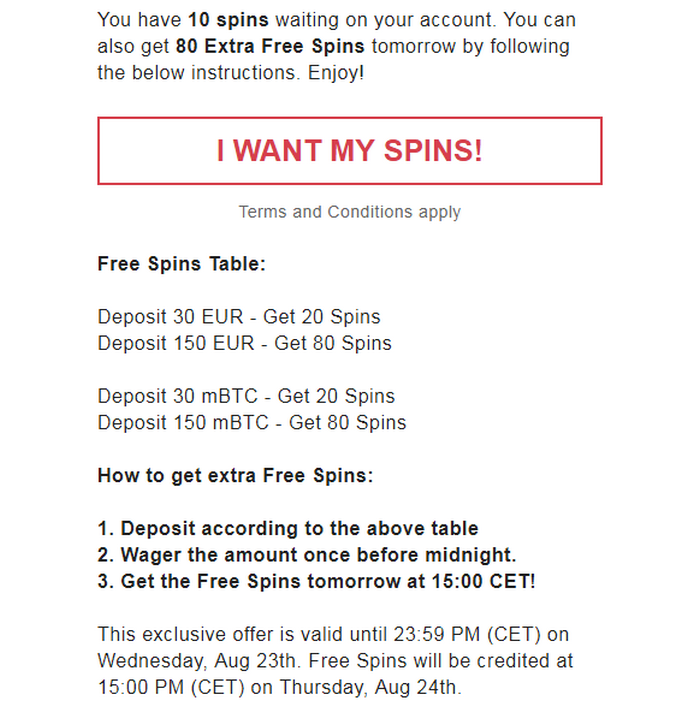 You have 10 spins waiting on your account. You can also get 80 Extra Free Spins tomorrow by following the below instructions. Enjoy! 2. Wager the amount once before midnight. 3. Get the Free Spins tomorrow at 15:00 CET! This exclusive offer is valid until 23:59 PM (CET) on Wednesday, Sep 20th. 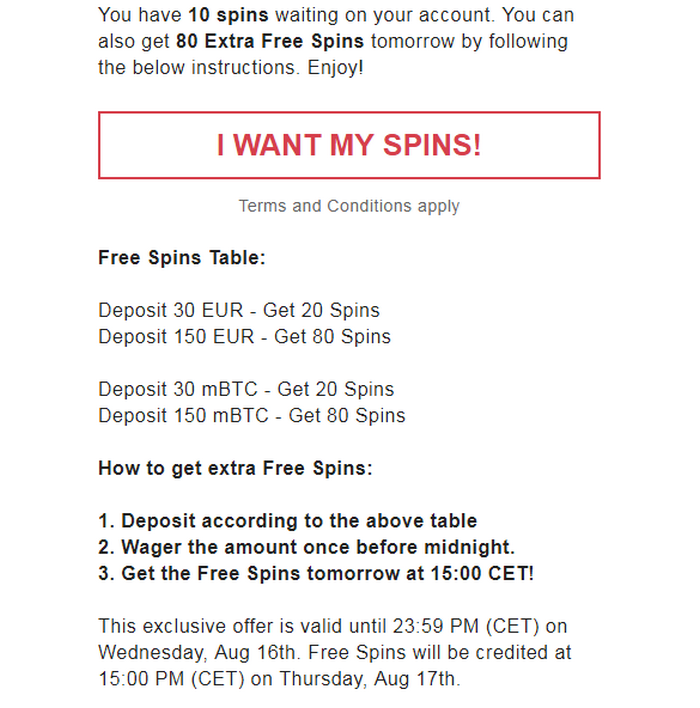 Free Spins will be credited at 15:00 PM (CET) on Thursday, Sep 21st. Świętujemy dzisiaj 4 lata i rzucamy najlepsze cholerne przyjęcie urodzinowe. Proszę, nie prezenty. Zamiast tego damy ci trochę! Zgadza się. Ile urodzin było w tym miejscu, skąd otrzymasz 20 darmowych spinów w grze Aztec Magic i 100% premii za pierwszy depozyt dnia (CEST)? Takimi jesteśmy dobrymi przyjaciółmi. Cieszyć się! 1. Wpłać co najmniej 5 €. 2. Zdobądź bonus 100% do 100 €. 3. Zagraj w ulubioną grę! On May 22 2010, Laszlo Hanyecz bought two Papa John’s pizzas for 10,000 Bitcoin ($41 at the time). Today, that amount of Bitcoin is worth over 80 million dollars, better have been some darn good pizzas. Like Hanyecz, we agree that there’s nothing better than a hot slice, so we’re celebrating Bitcoin Pizza Day in style. Pick the slices you like and get a 25%, 50%, 75%, or even 100% reload bonus, plus, dessert is on the house, as we’ve credited your account with 10 free spins on Lucky Sweets. Celebrate Bitcoin Pizza Day in style with a slice of pizza pie and some free spins on the side! This exclusive offer is valid until 23:59 PM (CEST) on Tuesday, May 22, on the first deposit of the day. Only recipients of this email are eligible. We’re all about power at BitStarz – you probably know that already - so we’re kicking off the week with Power of Poseidon and a lightning charged bonus offer to match! Deposit now and we’ll give you a 50% reload bonus on your first deposit of the day – hurry though, as this bonus won’t be hanging around. 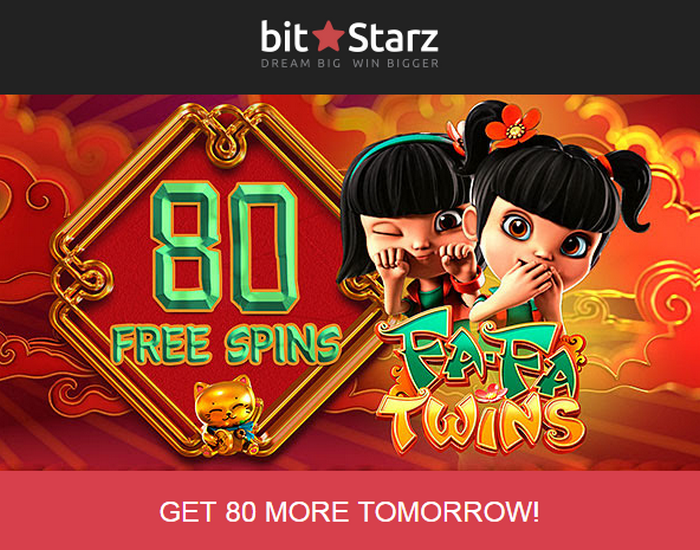 Power is running through the reels at BitStarz – smash the slots and stash the cash today! 2. Get a 50% bonus up to €300. Need help getting involved with our Monday Reload Bonus? Click here to speak to a live chat agent! You don’t like Mondays - we get it – so here’s a quick bonus to help you start the week with a boost rather than the blues. Deposit now and a 50% reload bonus is yours! Bonus is valid on first deposit of the day CET on Monday, January 21. We did it – thanks to our loyal players BitStarz has been crowned Players’ Choice casino at the AskGamblers Awards. This marks our second award win at the AskGamblers Awards in two years, as the players have spoken once again - BitStarz is the place to play in 2019. 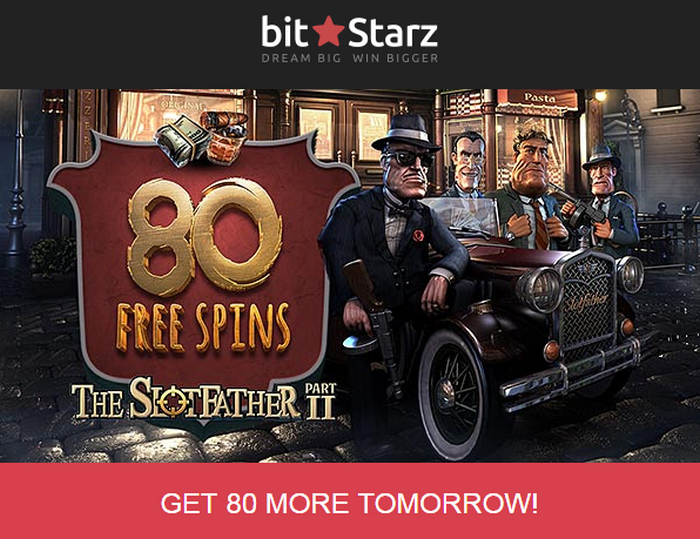 There is a storm happening at BitStarz, as Barnyard Twister and this exclusive bonus are letting the real money wins fly! Deposit today and we’ll give you a bumper 50% reload bonus on your first deposit of the day. Step into the eye of the storm and walk away with a big win! Bonus is valid on first deposit of the day CET on Monday, January 28.
Who says Monday has to be the worst day of the week? We have the cure for the Monday blues right here, deposit now and we’ll give you a quick and easy 50% bonus. Throw open the Book of Egypt this Monday and you could get your hands on some Ancient riches, but before you do that, how does a bumper bonus sound? Deposit now and we’ll give you a supercharged 50% reload bonus. Make your first deposit of the day that much sweeter – don’t miss this offer! Bonus is valid on first deposit of the day CET on Monday, February 11. Terms and conditions apply. Looking for a bit of extra luck? We’ve got it for you right here with loaded slot Lucky Streak 2 and a supercharged bonus. Deposit now and you’ll get a 50% bonus on your first deposit of the day. Some people have all the luck, right? $350,000 has just been won at BitStarz – that’s right, $350,000! Across two games – Jade Valley and Lightning Roulette – a player has scooped up one of the biggest paydays ever seen at BitStarz, and was paid out in full within a day! Helping you win big, deposit today and we’ll give you a 50% bonus and 10 free spins in Jade Valley! 2. Get a 50% bonus up to €100. Need help with the bonus? Click here to speak to a live chat agent! Bonus is valid until Sunday the 24th of February 2019. Wild Diamond 7x might be packed with precious jewels, but it’s certainly not the only thing set to dazzle and delight at BitStarz this Monday. Kick-start your week in style, as we’ll match your first deposit of the day by 50%. Banish the Monday blues and grab this sparkling bonus before it’s too late! Bonus is valid on first deposit of the day CET on Monday, February 25. Forget the Monday blues, as it’s time to smash the slots in Sugar Skulls with a scorching new bonus. We’re giving you an exclusive 50% reload bonuson your first deposit of the day. Start the week in style with some super sweet wins! Bonus is valid on first deposit of the day CET on Monday, March 4. $1,376,221.80 has just been won on a single Slotomon Go spin! This is the BIGGEST WIN EVER, and we want you to top it. Get 100 free spins on Slotomon Go when you deposit €25 or more this weekend. Maximize your chances by claiming this offer once per day every day (CET) this weekend! After depositing, go to My profile/Bonuses to activate your Free Spins. Need help? Click here to speak to a live chat agent! Swing from reel-to-reel this Monday in colorful and cash-packed slot, Cheeky Monkeys, with this exclusive bonus! Deposit now and we’ll match it with an a-peeling 50% reload bonus. Move quick, this bonus isn’t hanging around! Straight from outer space and onto your screen, Stellar Spins is a star-studded slot that can rocket you to big wins thanks to this exclusive bonus. We’re giving you a boosted 50% reload bonus on your first deposit of the day. This deal is out of this world – don’t miss it! Bonus is valid on first deposit of the day CET on Monday, March 18. We’re giving you a very generous 50% reload bonus on your first deposit of the day. The secret is out – this is the biggest Monday bonus around! Bonus is valid on first deposit of the day CET on Monday, March 25. No jokes and no pranks, we’re giving it to you straight this April Fool’s Day. It would be both crazy and bananas not to log into your account today as we’ll give you 20 free spins on Crazy Bananas just for doing so. Woho! Once you’ve enjoyed the spins, remember to deposit and claim your 50% Monday Reload if you haven’t already. Enjoy! BitStarz turns 5 today, so we’re throwing the ultimate birthday party! We’re giving you 20 free spins AND a 100% Monday reload bonus – that’s twice more than usual. 2. 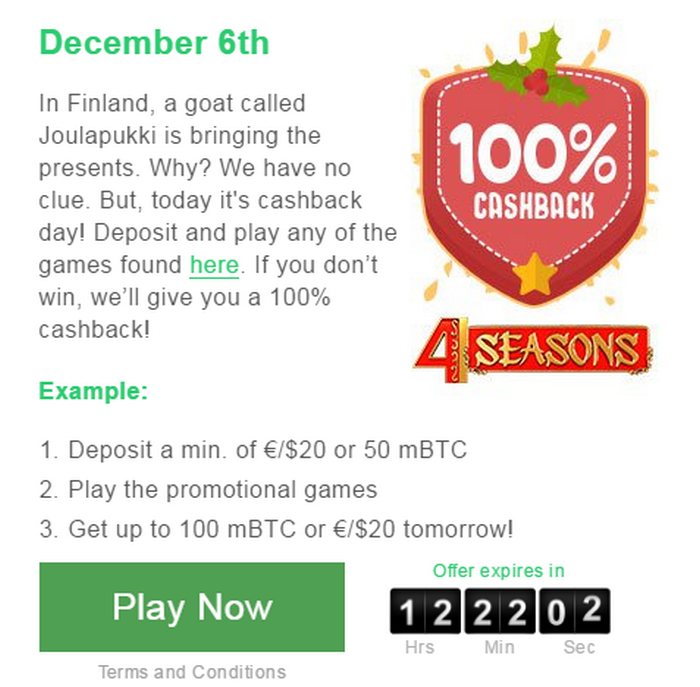 Get a 100% bonus up to €300. This exclusive 20 free spins offer is valid until 23:59 CEST on Monday, April 08. Only recipients of this email are eligible. Monday Reload Bonus is valid on first deposit of the day CEST on Monday, April 08. It’s time to unleash the dragon, as this exclusive Monday reload bonus lets you run wild in Mega Drago - the hottest slot around! All you have to do is deposit now and we’ll give you a 50% reload bonus. Mega Drago, mega bonuses, mega wins – what more could you ask for? Bonus is valid on first deposit of the day CET on Monday, April 15.